The Supreme Court of the United States has rejected the stance taken by the International Finance Corporation that it holds an absolute immunity from legal suit. The IFC had relied on a complete immunity to prevent a legal action being brought against it by a group of local fishermen, farmers and villagers from Gugarat, India. Mr Budha Ismail Jam and others claim that a power plant financed by the IFC had caused widespread and harmful pollution of the air, land and water in the surrounding area. The IFC, part of the World Bank Group, argued that it’s immunity provision, under which it is granted the same immunity from suit as that of foreign states, should be interpreted as an “absolute immunity”. It also argued that a flood of foreign plaintiff litigation and exposure to money damages would be the undesirable result of anything less than absolute immunity. The Supreme Court took the view these concerns were “inflated”. It also noted that other international organisations such as the UN and IMF had specified absolute immunity from judicial process in their charters, which was not the case for the IFC. Neil Macaulay, Co-Head of Chambers at BWL, believes this was a particularly bad decision for the World Bank Group, which has always strenuously sought to maximise its immunities from legal suit. Mr Jam and his neighbours have now exposed a clear chink in the World Bank Groups armour. However the ruling does caution that “restrictive immunity hardly means unlimited exposure to suit for international organisations”. There are still many hurdles that Mr Ram and his fellow petitioners must yet clear before the restricted immunity can be pierced in the lower courts. Overall however the clarification of the limits of the World Bank’s immunities for its commercial activities is to be welcomed. The decision is also likely to increase accountability of the World Bank’s activities through the availability of judicial scrutiny by the national courts and draw greater attention from the international media on the social and environmental impact of its projects. For the full decision see here. The World Bank Group (WBG) has published for the first time a joint report showing the key figures for debarments, cross-debarments and referrals made in the FY2018 under the WBG Sanctions System. The report collates the figures for sanctions, in particular the number and length of debarments, imposed through the means of settlements with the Integrity Vice Presidency (INT), determinations by the Suspension and Debarment Officer (SDO) and the decisions of the Sanctions Board. 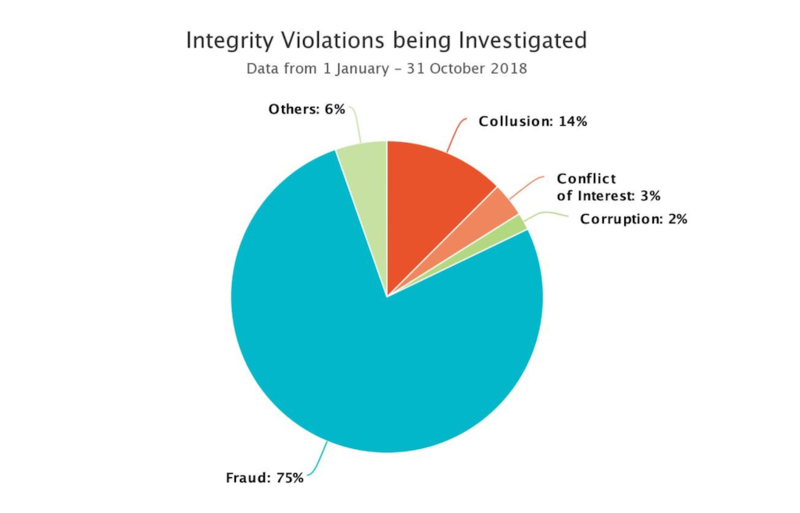 In addition, the report also contains figures for the last five years that reveal the increasing use of settlements to deal with fraud, corruption, collusion and obstruction infractions under the Bank’s Sanctions System. Sanction settlements have multiplied from just seven to thirty-nine cases per year between 2014 and 2018, whilst the number of sanctions issued through the SDO’s determinations have fallen over the same period from forty-five to twenty-four cases. Disposals by the Sanctions Board have remained fairly constant over the five-year period with an increase of just one to twenty cases. Neil Macaulay, Co-Head of Chambers at Bretton Woods Law, believes the continuing sharp increase in settlements over the last year may be readily explained since the vast majority of the shortest periods of debarment have been imposed through negotiated settlements. In other words settlements have become more attractive to those entities facing the sanctions process as the periods of debarment being negotiated with INT are increasingly considered acceptable. The report helps to puts some statistical flesh on the bones. Of the twenty-nine cases with the shortest periods of debarment, those from one year and six months and below, only one was a result of a determination of the SDO, four emanate from the Sanctions Board and twenty-four were achieved by negotiation settlement with INT. Significantly these lower penalty settlements also include five cases of ‘conditional non-debarment’ which permit the entities concerned to remain eligible for World Bank funded work provided they engage in remedial integrity compliance work. The growing attractiveness of settlements and the arrival of a new Vice President at INT, Pascale Dubois, is likely to be more than co-incidental, as she is keen to express in the report the benefits of settling sanctions matters in terms of the saving of resources and certainty of outcome for both the investigated party and the WBG. Ms. Dubois’ plainly incentive words regarding self-reporting appear to be backed up by the reported figures. All five of the cases listed as resolved by conditional non-debarment were arrived at through settlement with INT. By stark contrast nearly all the cases resulting in the longest periods of debarment emanate from either the Sanctions Board or the SDO. Of the thirty-one most severe sanctions awarded, upwards from three years to ten and a half years debarment, only three arise from settlements and the bulk are divided between the Sanctions Board with nine disposals and the SDO with nineteen. Overall the WBG report is to be commended as it provides a welcome degree of transparency into the current trends in disposals of sanctions cases by the three distinct limbs that comprise of the WBG Sanctions System and points towards the likelihood of a more favourable debarment outcome through settlement than the alternatives, even taking into account the additional co-operation requirements INT may require under a settlement. It therefore enables those who may be subject to an investigation by INT to make a more informed approach as to the relative merits of settling the case early or running through the SDO/Sanctions Board process.